Find out the "First Things, First" - What you need to know and do, so you can actually DO IT! In How to Open a Restaurant: Due Diligence, you will gain information and incite while completing the 13 Instructions. Following this guide is doing your Due Diligence; pointing you toward the reality of realizing your vision and starting your new restaurant. Testimonial: I have to say How to Open a Restaurant: Due Diligence is very well done and extremely actionable. I have read other books on this subject and they have not been nearly as informative and detailed. Breaking down the whole process into different phases makes it even more efficient, saving time and money. I look forward to working with you, Frank. Are you imagining opening a restaurant or already beginning the process? Are you an independent owner or a franchise owner of a restaurant? Are you an investor of a restaurant or other food service facility? Are you responsible for curriculum in your culinary school? Do you teach culinary or hospitality in a college, community or technical school? Prepare for SUCCESS. 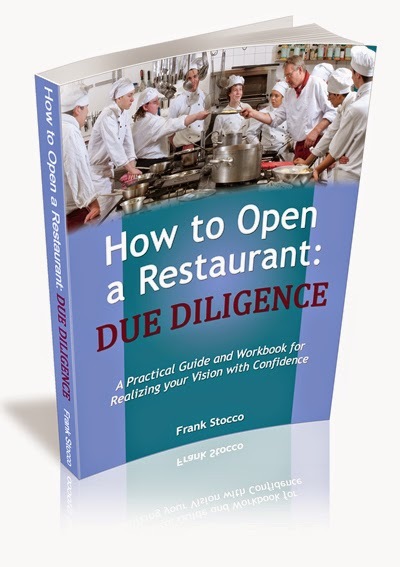 Frank Stocco's book, How to Open a Restaurant: Due Diligence is full of advice and knowledge from over 40 years of experience in the food service industry. Frank, has made all the mistakes, and has learned along the way how to DO IT RIGHT. Take his advice; he's opened, run and sold many successful restaurants. Frank is a food service consultant (www.nationalrd.com) who designs for restaurateurs, architects and equipment companies. everything you need to know and do FIRST before you sign anything!!! View the Table of Contents and Introduction. Click the BUY NOW button in the sidebar to order and pay securely through Paypal by credit card. Buy now. Reduced to $42. For discounts on quantities of 15 or more or school discounts, email books@nationalrd.com. © 2011 Frank Stocco. Simple theme. Theme images by Storman. Powered by Blogger.